Your Script includes a unique Account Number that allows you to contact us anytime! Pop Icon Mr. Cold Call™ guarantees that you will be completely satisfied with this customized script download purchase that if you see a sales opener, topic, theme, objection, sales rebuttal, voice mail message, sales tip, question or concept that is not already included in this Insurance Cold Calling Script then you may email our customer support at anytime with your question and receive a response within 72 hours. This guarantee has no expiration date. In your email, please insert your Script Account I.D. Number (included with your one-time script download purchase) so that our customer service team can quickly identify and confirm your original download purchase. This I.D. Number is needed to fully take advantage of this lifetime and unlimited email support guarantee. WHAT ARE 3 EXAMPLES OF HOW I COULD PUT THIS GUARANTEE TO USE? First example, let's say you encounter a sales objection that is currently not listed in this script then you can immediately email customer support and receive a sales rebuttal within 72 hours. Another example, your firm just introduced a new product to sell. If you find that Pop Icon Mr. 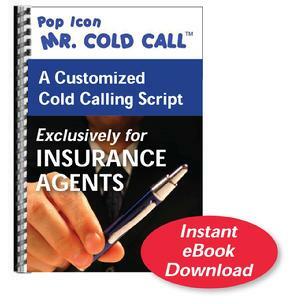 Cold Call™ does not address this insurance and/or financial theme then you can take full advantage of this script's lifetime support email guarantee by contacting customer service to get a customized sales opener that you could use to contact sales prospects. A third example, you need additional engaging questions to ask a prospect on insurance and/or financial related services that you're required to sell at your firm. If this these questions cannot be found in this script then simply email customer support with a detailed request. In summary, any insurance and/or financial theme that is not addressed in this insurance script just contact our customer support team anytime and receive a response within 72 hours. Please also note that we will not re-write the entire script for you, however, we will address specific questions not addressed in the script and then accommodate your requests. "Think of this eBook download purchase as a service that you only need to pay once for!" Online payments are processed by Paypal our secure payment provider. Paypal uses SSL technology to guarantee a safe and secure shopping environment. No need to register if you do not have a PayPal account.